Back when I studied in Adelaide, I knew a fellow angmoh gaijin in my student housing block. From the agricultural centre of South Australia, his parents and brothers were all fanatic fans of V8 Supercars, contact sports and brews. By comparison, my friend did all hikikomori proud with his den of computer parts, anime posters and pale skin. Isn’t it fascinating that the same environment and genes can produce such different people? Alas, I only met with him a few times, and most involved me watching him packing up his veritable shrine of all things anime after he graduated. Among the regular Evangelion–era stuff, one series he had a particular fixation on was Mahou Shoujo Lyrical Nanoha. He had wall scrolls, DVDs, even an innocent dakimakura with his favourite character thumbtacked to his door. As you do. 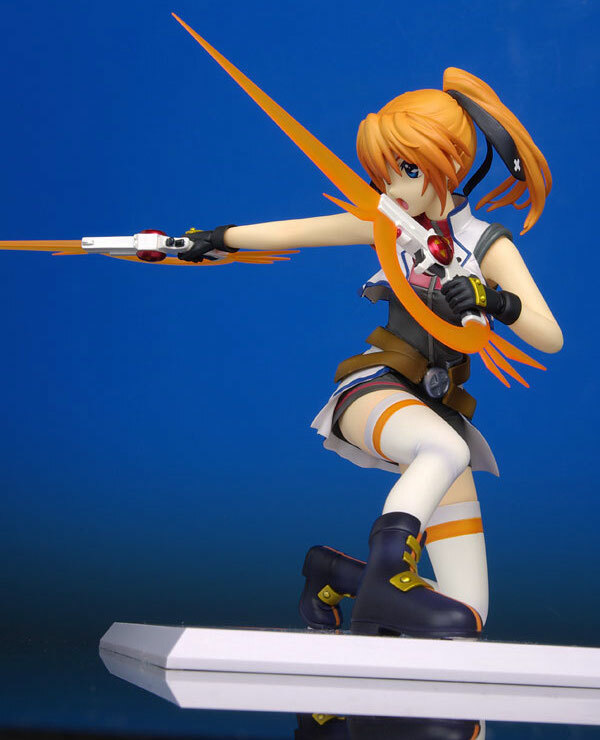 When Clara showed me this classic Alter fig of Teana Lanster from StrikerS, the memories all came flooding back light the blinding orange light from a magical gun of some sort. I remember seeing this fig in 2009, and wondering what those orange inserts were. Guns are so dull; I’d secretly hoped that maybe with a little mahou shoujo magic they’d turned into mysical rounded blades she would use to smite her enemies. I’ve never watched, read or played anything from this franchise whatsoever. Yet, my nostalgic side wouldn’t mind having this fig one iota. Maybe I should add her to The List!